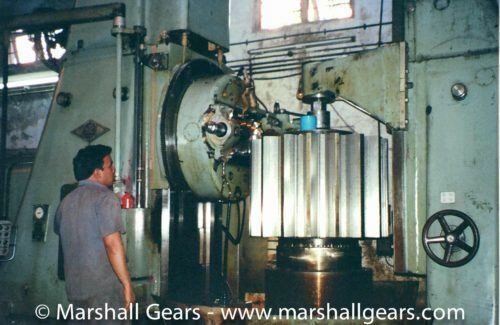 Marshall gears is a Helical Gear Manufacturer based in Mumbai, India. We make helical gears from 100 mm to 3600 mm Diameter and upto 32 Module. Helical gears transmit rotary motion between crossed or parallel shafts. Helical gears have gear teeth that are inclined at an angle That’s why the teeth to the axis of the shaft. This way two or more teeth are always in contact with each other when the mating occurs. This permits smoother action than that of spur gears. Interestingly , there is an axial thrust that is generated because of the angle of the teeth. This axial thrust causes a slight loss of power and requires the use of thrust bearings to balance the thrust out. 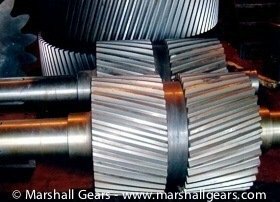 Helical gears are used where higher load bearing capacities are required in prime movers and power applications. The teeth are having a inclination ranging from few degrees to up to 30 degrees or more depending on the gear application. Helical gears have higher contact area compared to spur gears and this gives it more load transmitting properties. Helical gears produce a side way thrust while operating at high speeds and hence often used with thrust bearings to balance the side thrust. Another way to balance the thrust is to use Double Helical gears, which are self-balancing by the very nature of their construction. As A Helical Gear Manufacturer We manufacture the following Types of Helical Gears. We manufacture Helical gears on German hobbers are able to cut gears upto DIN / IS 6 - 7 class depending on the gear type. 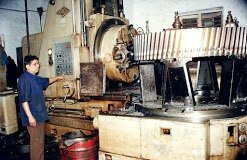 We manufacture small to large Single Helical Gears that are used in Gearboxes, Machine tools, Steel rolling mills, Cement plants, Drying plants, Processing plants, Rubber plants, etc. 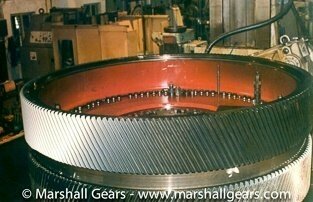 Always being one step ahead has helped Marshall serve customers just that much better than other gear manufacturers. 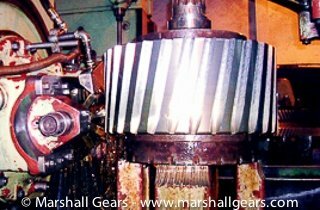 Small and Large helical angle gear cutting is one way we do that. Using our new west German Gear Hobber, rather than fixed guides, saves our customers months of time, and delivering perfectly cut helical gears in short delivery time schedules. We manufacture Helical Girth gears in 2 segment construction or single piece depending on the gear application upto 3600 mm Diameter and 32 Module. We supply these to the Cement, Steel, Mining, Heavy Machine tool building, Engineering, Marine, Sugar Industries. We manufacture Helical Pinions from forging materials like EN 9, EN 19, EN 24,etc. We manufacture Helical Pinions upto 32 Module and 800 Face width. We supply helical gears and pinions for the Cement, Steel,Machine tool building, Mining, Engineering, Marine, Sugar Industries. We make Helical Pinion shafts as well as Double Helical Pinion shafts in different shaft lengths and sizes. We can make pinion shafts upto 3000 mm in length and 32 Module.